Birthdate: October 31 Age: 18 years old Height: 168cm Weight: 49kg Tae Shimura is Shinpachi's older sister. She runs the Kakidokan Dojo, which was her father's failing dojo, with her brother. She is usually addressed as "Otae"; the "O" is an honorific used to refer to women. Kagura always addresses her as "Big sister"(ane-go). 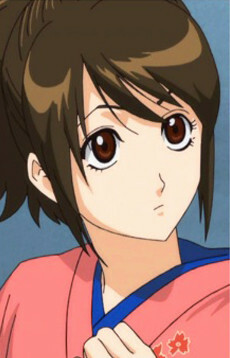 Despite her sweet face, she is one of the most violent characters in Gintama (and arguably strong too). She mercilessly beats up Kondo Isao and Gintoki whenever they anger her; in episode 19, she mercilessly kicks the men out onto the road (namely her brother, Gintoki and Hasegawa) so as to stop a car for a hitch ride. She often displays her trademark sweet-looking smile with her eyes closed before engaging in her violent activities. Her killer intent is so strong that on one occasion, a stare from her brings the entire Shinsengumi on their knees begging for mercy. Her weapon of choice seems to be a naginata, a Japanese spear. Her cooking skills are terrible, seeing as her tamagoyaki (i.e. sweet fried egg) is so inedible that Kondo suffers amnesia after eating it and others are barely able to swallow it down. Yamazaki even describes it as "poison" after some of it accidentally gets into his eye. When Kagura tried to hypnotize herself into eating Otae's cooking, Shinpachi objected, saying that Otae's cooking is the reason for his poor eyesight. She has, so far, been called flat-chested three times in the anime; another in 59 by Gintoki; and the third time by Shinpachi, who thought that Kyubei Yagyu wanted to marry her because Kyubei took her as a male (that her chest is so flat that she looks like a guy). She has strong principles and believes in maintaining what is precious, even if it means throwing away honor and dignity. She once says that if apologies were enough, seppuku would not exist. Her favourite food is Häagen-Dazs ice-cream, but it is called Bargain Dash in the manga and anime.